Small Animal Talk: Why we should care about veterinary dentistry? Why we should care about veterinary dentistry? 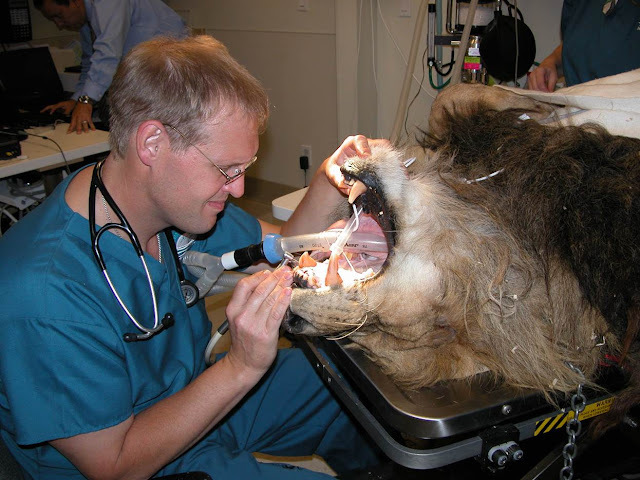 Dr Brook Niemiec performs an oral examination on a lion. What’s the most common disease seen in companion animal medicine? To some extent it varies geographically, but time and again oral and dental disease hit number one on the list. Why is that? 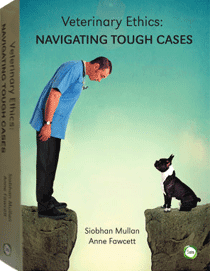 One of the challenges of veterinary dentistry is that it is a relatively recent field. Yes, animals have always had teeth, but “in addition to the problem of a lack of perceived pain, dental education in the veterinary curriculum is limited and it is a subject clouded by myths and misinformation,” said to Dr Niemiec. The number of specialist veterinary dental services available has exploded, as has the use of veterinary dental radiographs (it still stuns me to think that when I graduated it was not routine to use these, and we're talking mid 2000s, not the 1800s). Dr Niemiec is chairing the World Small Animal Veterinary Association’s (WSAVA) Dental Guidelines Committee. WSAVAs working groups have already compiled Guidelines on vaccines, nutrition and pain management which can be accessed here. The Global Dental Guidelines are set to be released at the WSAVA World Congress in 2017. As the owner of a now toothless Maltese who had terrible periodontal disease when I adopted him, this is a much needed initiative and I await the results eagerly. (You can read about Phil’s veterinary adventures here) (And while I did some of the work, Dr Christine Hawke, of Sydney Pet Dentistry, helped improve Phil’s quality of life significantly with her skills and advice). One of the things I've observed through my career is an increase in the sensitivity of both owners and veterinarians to dental disease. We now have people presenting animals because they have bad breath, or because they have noticed gum recession, or because they're chewing on one side of the mouth. Veterinarians are more proactive in recommending treatment. I think we're saving a lot of teeth that would have been doomed were it not for early intervention. In part we have some very proactive veterinary dentists to thank for raising awareness - but there are still plenty of animals that put up with oral pain and discomfort for too long. Members of the committee have more letters than alphabet soup, and are: Brook A. Niemiec DVM, DAVDC, DEVDC, FAVD, Jerzy Gawor, DVM, DAVDC, DEVDC, FAVD, Marco Gioso, DVM, DAVDC, Australia’s own David Clarke, DVM, DAVDC, Cedric Tutt, DVM, DEVDC, Ana Nemec, DVM, DAVDC, DEVDC, Gottfried Morgenegg, DVM, Marge Chandler, DVM, MS, MANZCVSc, DACVN, DACVIM, DECVIM-CA, MRCVS, Paulo Steagall, MV, MS, PhD, DACVAA and Rod Jouppi DVM.